As the vegetation begins to die back, it's back to trench mapping field work. As in previous years this will form the baulk of posts over the winter. Unless you are really interested in practice field works, these posts could be quite boring as one hole in the ground looks like another! So I thought I would start with what I think is an interesting survival. 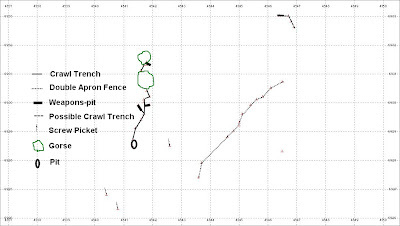 What makes this crawl trench system interesting is the surviving wire pickets. A line of long screw pickets and short pickets remain, without doubt the remains of a double apron wire fence. 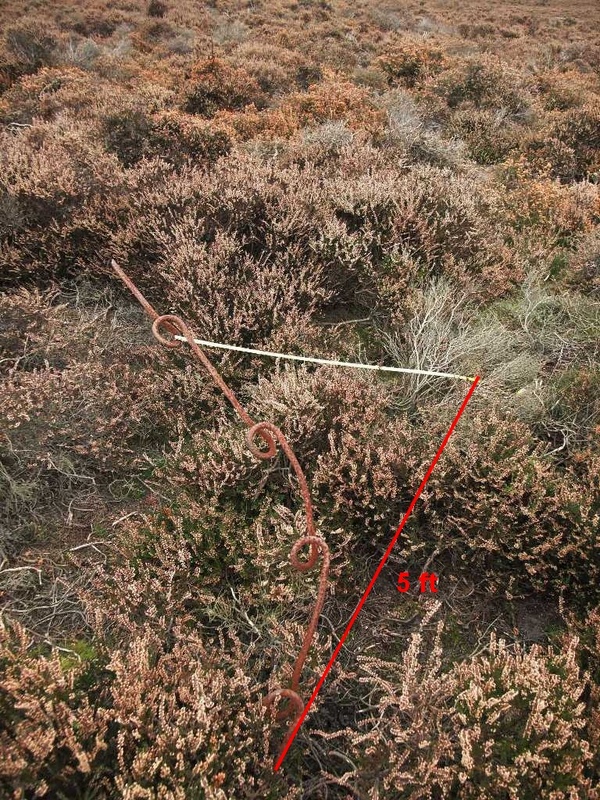 So assuming this earth work was dug for training purposes (to date I have found no Field force localities in the area), it would seem likely that wire was erected as part of the training in constructing this defence post. 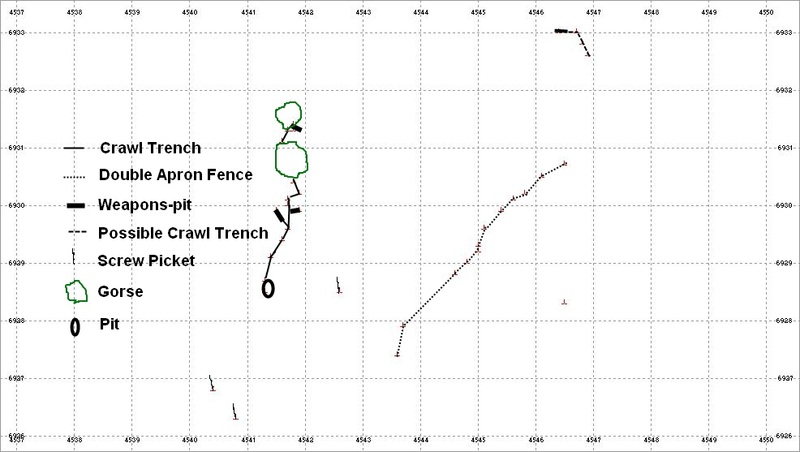 Above: GPS plan showing the Crawl Trench system and the remains of the double apron fence. 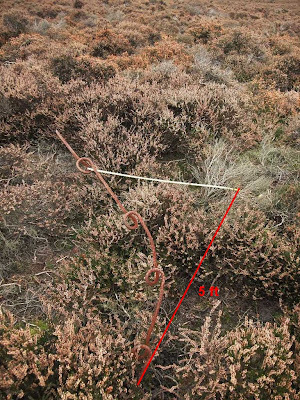 Bottom photo shows the general area - the trench system is in the area of the gorse scrub and its easy to see how the position, located on the high ground, dominates the area. I actually found this trench during the summer, deciding to visit an area I had never found any signs of earthworks in the past. Apart from a few isolated V shaped weapon-slits this is still the only earthwork I have found in this area to date. There is also no evidence of any live firing exercises (i.e no evidence of shell fragments or .303 cartridges). Image 1 - Pit with Crawl trench. The pit could have been a dug-out, mortar pit or anti-aircraft gun pit (i.e Bren or Lewis on an AA mount). Image 2 & 3: Long screw pickets. Image 4: Short screw pickets - the diagonal wires of the apron fence would have run from the long pickets to the short pickets. These diagonal wires would have supported the apron wires. Image 5: Shows my tape acting as a diagonal wire (unfortunately the long picket is bent!). The distance between the base of the two pickets is 5 ft. Image 6: A sketch of the double apron fence. Anyway will try and stick in the occasional non "Westleton crawl-trench" post between now and Feb. Other work planned for this winter is some more work on the Eastern Command Line and hopefully a resumption of my annual trip to the Somme in March (really missed not going last March!). Check out the website - have begun to post some links to film dating from WW2. Also revisit the post on the Demonstration of Obstacle crossings (Part 3 I think for a link to film showing a scissor bridge). I love the footage of British troops in the exercise dressed up as Germans! The last post on the section of the Corps Line from Elmswell to Euston which I visited back in September. This post will look at the remains of the line from Ixworth to Euston. Along this section of the line, the River Black Bourn formed the anti-tank obstacle and the line followed this river from Ixworth to Barnham. Going north from Ixworth the first remaining pillbox can be found at Ixworth Thorpe, which was a defended place with 24 members of the Home Guard from "C" Coy, 2 Battalion Suffolk Home Guard. Above: Type 24 pillbox, Ixworth Thorpe, incorporated into a haystack on my visit! Next up is a pillbox guarding a bridge over the Black Bourn at Fakenham Magna. This is completely overgrown and being in a private garden, there was no access to it. Pillbox guarding a river crossing at Fakenham Magna. The pillbox is completely covered in vegetation and is just behind the bridge on the left hand side of the photo. South of Euston are two more pillboxes. On is unusual as it still has remains of what appears to be black camouflage paint. The paint presumably would have helped hide the embrasures and its is notable that the paint is from approx embrasure level to the roof. Above : Two Type 24 pillboxes just south of Euston. The first two images show black camouflage paint still visible on one of the pillboxes, presumably to help hide the black shadow effect of the embrasures. At Euston another Type 24 pillbox and a few concrete cylinders can be seen by a bridge, remains of a roadblock. Euston itself was a defended place with at 1941 a garrison of 10 Home Guard from "E" Coy, 2 Battalion Suffolk Home Guard. This post will look at some of the remains of the Corps Line from Stowlangtoft to Ixworth. Ixworth itself was a Category B Nodal Point (I need to update the website page on Nodal Points to explain the categories for Eastern Command) and was garrisoned by men from "C" Coy, 2nd Battalion Suffolk Home Guard. As at 1941 the garrison strength was listed as 49 men with 34 rifles, six Browning light automatic rifles, three machine guns, two sub machine guns and two Northover projectors. In addition it was considered that an additional company of infantry and one troop of anti-tank guns would be necessary to hold Ixworth if it was attacked. 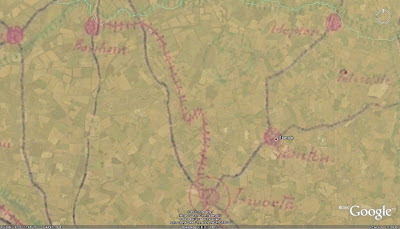 From Ixworth north to Euston (to be covered in future posts) the River Black Bourn forms an obvious anti-tank obstacle. At Stowlangtoft (a category C Nodal Point and in 1941 garrisoned by 28 men also from "C" Coy 2nd Battalion Suffolk Home Guard, with 20 rifles, two Browning light automatics and one machine gun) two Type 22 pillboxes can be seen. Both are overgrown with vegetation, one partially destroyed and one complete. In the complete pillbox some highly evocative graffiti can be seen: "THERE'LL ALWAYS BE AN ENGLAND AUG: 21 1940". I assume the damage to the partially destroyed pillbox was again a result of training during the War. These pillboxes, along with the one north of Stanton Street (see previous post) and the one north of Bridge Farm were obviously sited to cover the local road network, the A1088 leading to the Nodal point of Ixworth. Image 2: "THERE'LL ALWAYS BE AN ENGLAND"
Image 3: Due to the road signs, the ivy is kept in trim and cannot hide the fact that there is a pillbox underneath it all! Image 4: Inside of the ivy covered pillbox, clearly damaged presumably by wartime training. Note the wood shuttering used for the roof, the only one in the area as all the rest used corrugated iron sheets. Image 5: Type 24, Bridge Farm just south of Ixworth. Although work on the Inland Stop Lines was halted in Sept 1940, work on fortifying Nodal Points continued into 1941. My time in Ixworth was all too brief, a flying visit to look at sites already recorded on the Defence of Britain data base. As far as I know, no pillboxes survive in Ixworth or its surrounds, the only remains being that of road blocks. I visited two sites with recorded road block remains and had the pleasant surprise of coming across a third not on the data base. But first the two sites already recorded. The first is near the old Priory and consists of several concrete cylinders that have now been incorporated into the river bank defences. The second, at the site of an old windmill, just to the south of Ixworth, consists of a number of concrete cylinders that have obviously been gathered from the surrounding area. The site I came across and is not on the copy of the DOB data base I have is at Fulmer Bridge, Grimstone End. It consists of three cylinders by the side of a small bridge. It would be nice to think that these cylinders are where they were left during 1940, ready to close the road block - but I suppose they could equally have been put in their current position by the farmer to block off the gap between his gate and the bridge railings.This whole area is worthy of further exploration and to quote you know who: "I'll be back!" Image 6: Concrete road block cylinders now incorporated into the river bank to help prevent erosion. Image 9: Concrete road block cylinders, Fulmer Bridge at Grimstone End. The first of a few posts on the Corps Line. This ran from River Orwell to Ipswich - hence River Gipping to Haughley - hence approx Tostock - hence river line to junction with Little Ouse NW of Euston. This Stop Line is often referred to the east arm of the Eastern Command Line, however I have found no reference to this in files at TNA so will refer to it as the Corps Line as the documents I've seen do so. 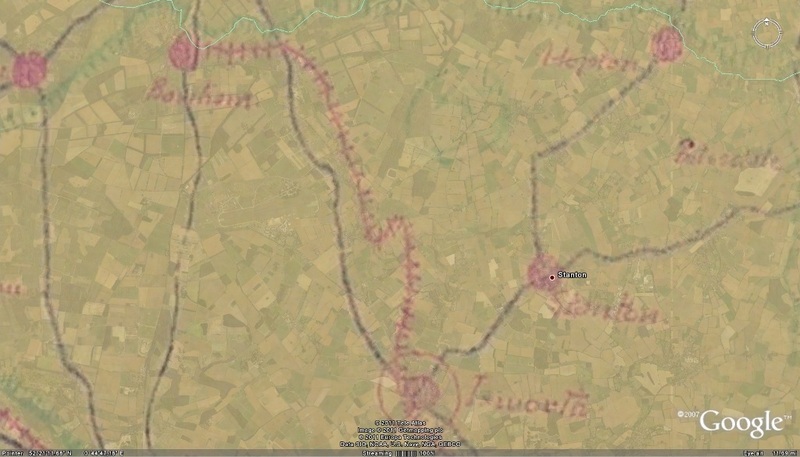 Of the Stop Lines in Suffolk the Command Line and the Corps Line were the only ones planned to be developed into defensive lines with priority being given to the Command Line. As work was more or less halted on inland Stop Lines in Sept / Oct 1940 the Corps Line was probably never developed as planned. It is certainly much weaker than the Command Line with 'bullet proof' Type 22 and 24 pillboxes only which were also much less densely sited than on the Command line. The Corps Line would also seem never to have reached the stage of development in depth as on the Command Line. 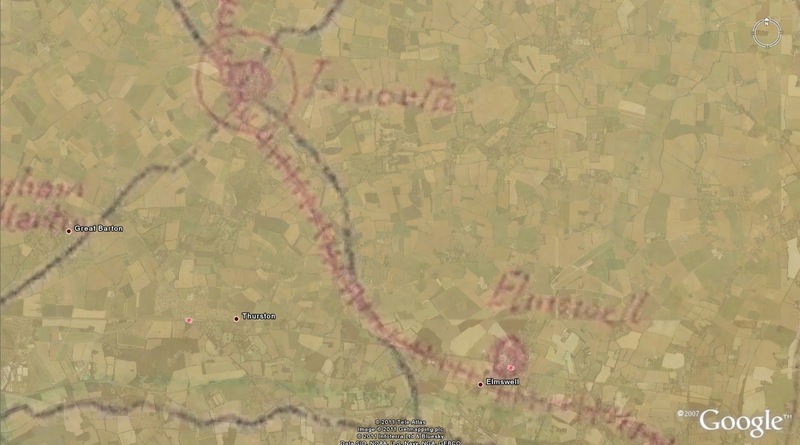 Below: The Corps Line from Elmswell to Ixworth. This post will look at some of the remaining defences in the area Elmswell to (excl) Stowlangtoft with Part 2 looking at Stowlangtoft to Ixworth. The railway line between Haughley to Elmswell appears to be the planned anti-tank obstacle but between Elmswell and Stowlangtoft the pillboxes seem sited to cover the A1088 rather than any anti-tank obstacle - it is likely that this stage of construction of the Stop Line (i.e a continuous anti-tank obstacle) was never completed. The fist set of photos show standard anti-tank 'pimples' blocking a crossing over the rail line. In the third photo two larger blocks can be seen which would have taken a metal rail to block the actual crossing point. Just to the west of the block is a bullet proof Type 24 pillbox. The next pillbox is just to the south of Norton again a bullet proof Type 24.. The pillbox at Stanton Steeet has been partially demolished probably during the War as part of training. The Corrugated Iron sheet used for shuttering the roof is clearly visible along with the reinforcement rods used in the roof. All of the pillboxes in this area have been constructed with wood external shuttering and internal brick shuttering - which can be seen in the images below. The photo below is of the pillbox just north of Stanton Street.